Students of history, Scholars of style. High fashion, Low prices? That's just how we roll. Our hands-on teaching model means you’ll get loads of first-hand experience working with a diverse clientele, and our small class sizes means everyone gets one-on-one time with an instructor. 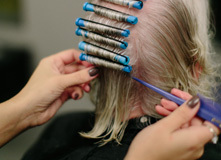 This isn’t your mother’s cosmetology school. I like how supportive everyone is of each other! It's like a real salon setting! You actually get to learn, hands-on, how to interact with clients. I love Amber's because everyone is so helpful and kind. You never feel intimidated when trying new things, because you will always have help! I love Amber's because there are a lot of opportunities to better your techniques. This school is very professional. Everyone is always nice and has a good attitude. I love the flexible schedule and payment plans! 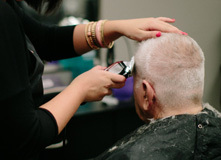 From haircuts and facials to manicures and pedicures, customers have relied on Amber’s Beauty School for top-quality salon services for more than 70 years. Stop in today to see why, after all these years, Amber’s is still in style.